When most people talk about social media and corporate reputation, they talk about being prepared for social media firestorms, stakeholder perception, and how people are more likely to purchase products from companies they trust. All of these conversations are certainly part of the equation, but what about the subtle stuff? Does it matter? Should we care? Sommermeyer then applied the question to social media, asking "If an A-lister Twitters alone in the wilderness, will anyone hear?" He's not the first person to ask. He certainly won't be the last. And yet, more and more, I think it's the wrong question. We no longer have to hear the tree fall or tweet chirp. Online public sentiment toward people, products, companies, and organizations doesn't have to erupt in some fiery fashion like the favored case studies among social media speakers. The real danger is that there will never be a sound nor will anyone hear the explosion. Or, to borrow the analogy I employed on RecruitingBlogs, maybe you don't have to hear the fall when the epicenter resembles the aftermath of the 1908 Siberian explosion. The unaddressed wreckage speaks for itself. 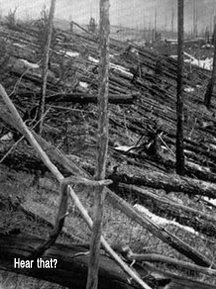 Sure, the Tunguska event took place after a ball of fire exploded about 6 miles (10 kilometers) above the ground. But it doesn't always have to be that way. Social media is much more likely to knock one tree down at a time, slowly eroding the brand. Nobody hears anything. Since we've started researching online sentiment for several companies, organizations, and industries, we've noticed that most of the damage is subtle, seemingly one tree at a time. • A public utility with customer service complaints written out in vivid detail, including customers left without heat for a winter weekend. • A physical therapy practice considered area experts in its market, but with an online presence so thin that prospective patients are more likely to find faith healers. • A government agency that invests 90 percent of its time answering questions posed by traditional media while ignoring citizen advocates that are 90 percent more likely to adopt the agency's message. • An entire industry suffering from a labor shortage, with recruitment efforts being undermined as potential employees discover more than 80 percent of all online comments are negative and the remaining 20 percent are best described as neutral. In all of these cases, there was no thunderous explosion. The challenges are subtle, with one tree dropping at a time until entire forests are laid bare or, if you prefer, the brand has eroded beyond recognition. And this is the way most brands end, not with a bang but a whimper. Not that you are sounding like spam (but you are), but that would be awful advice for anyway. Junk traffic generators like autosurfmonster.com are sure way to destroy your page rank, be suspended from Adsense, and otherwise diminish the quality of your blogs.